Benito Jacovitti, who would become Italy's most famous cartoonist, was born on this day in 1923 in the Adriatic coastal town of Termoli. 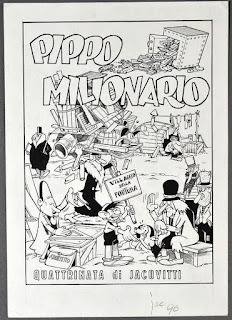 Jacovitti drew for a number of satirical magazines and several newspapers but also produced much work aimed at children and young adults. His characters became the constant companions of generations of schoolchildren for more than 30 years via the pages of Diario Vitt, the school diary produced by the publishers of the Catholic comic magazine Il Vittorioso, which had a huge readership among teenagers and young adults, and for which Jacovitti drew from 1939 until it closed in 1969. 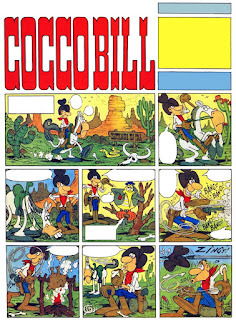 Jacovitti gave life to such characters as "the three Ps" - Pippo, Pertica and Pallo - as well as Chicchiriccì and Jack Mandolino via their cartoon adventures in Il Vittorioso, introduced Zorry Kid, a parody of Zorro, through a later association with children's journal Il Corriere del Picoli, and the cowboy Cocco Bill, who emerged during his 10-year stint as cartoonist for the daily newspaper, Il Giorno. 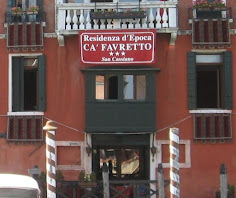 Born Benito Franco Iacovitti, he was the son of a railway worker. Both his parents had Albanian origins. His first names stemmed from his father's fascination with the powerful political figures of the time. Benito showed the first evidence of his artistic talent as a small child. He would draw comic stories on pavements in Termoli at the age of six. The family moved to Macerata in Marche, where Jacovitti attended art school from the age of 11, and then to Florence, where he enrolled at the Art Institute as a 16-year-old. It was there that he acquired the nickname lisca di pesce (fishbone) on account of his rather scrawny physique. He adopted the nickname as his signature. 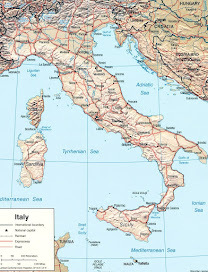 He launched his career with the Florentine satirical magazine Il Brivido, where he decided he preferred his second name to begin with a 'J' rather than an 'I'. 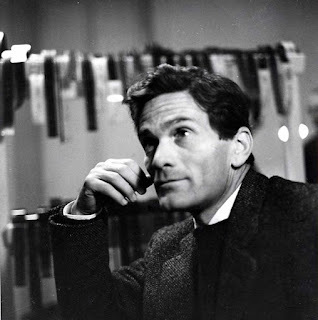 The work with Il Vittorioso came soon afterwards and made him a household name. Notable for his sense of the absurd, Jacovitti drew figures that inevitably had huge noses and gigantic feet and were sometimes quite grotesque. He has cited Elzie Crisler Segar, creator of Popeye, as one of his influences. 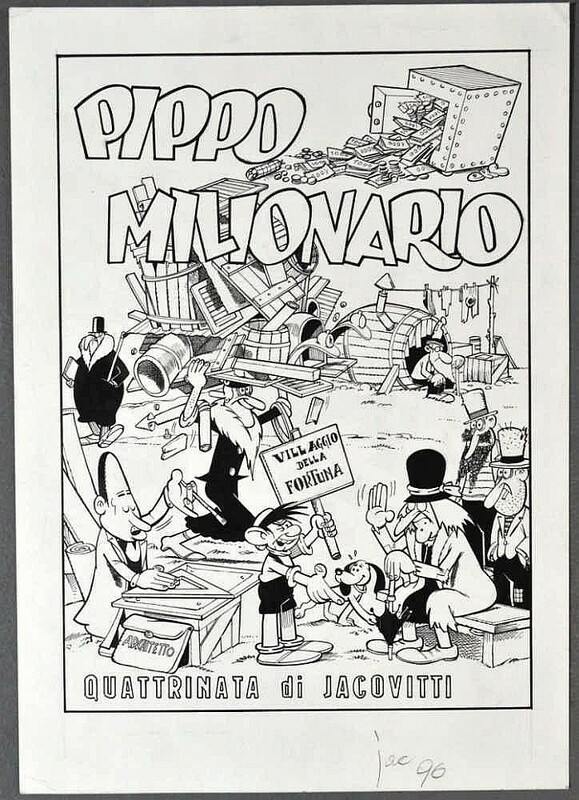 Though he became known for the characters and storylines he invented for his young audience, Jacovitti continued to maintain his skills as a satirist, drawing for the magazine Il Travaso for much of the 1950s under the signature of 'Franz'. During his time with Il Travaso, he collaborated with the film director Federico Fellini on an anti-communist strip that was very popular. Controversially, he also worked on Kamasultra, a comic book parody of the Hindu adult text the Kamasutra, which in some eyes somewhat tarnished Jacovitti's reputation. He began to draw for newspapers in the 1950s, first for Quotidiano and, from 1956 to 1966, for Il Giorno, the national daily based in Milan. 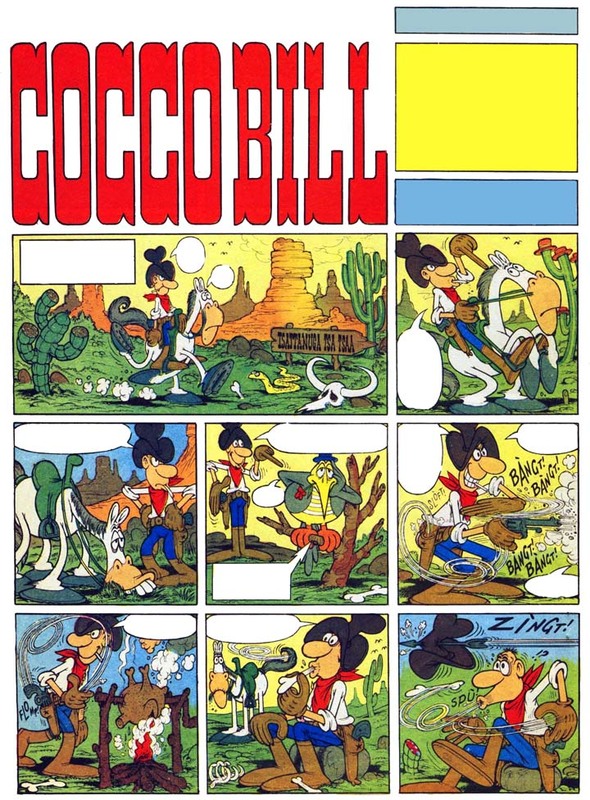 Jacovitti's work was published in many other periodicals in Italy and abroad and he had commercial companies queuing up to use his characters in advertising for their products. They appeared in commercials for Eldorado ice cream, Fiorucci salami, Teodoro oils and Fiat cars among others. During his career, Jacovitti created more than 60 characters and produced around 150 books, making him one of the most prolific and original artists in comic book history. He was a great admirer of Carlo Collodi, the creator of Pinocchio, and illustrated a number of editions of the famous story during his career. 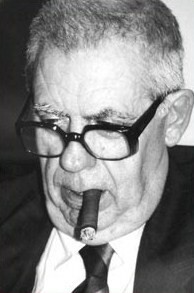 Awarded the title of Knight Order of Merit of the Italian Republic by the President, Oscar Luigi Scalfaro, in 1994, he died in Rome in 1997 at the age of 74. Termoli, once primarily a fishing port but now a popular tourist resort, particularly with Italian families who flock to its sandy beaches, is notable for the Borgo Antico, an historic old town that sits on a promontory surrounded by walls which, on one side, drop into the sea. An 11th century castle stands guard at the entrance and many of the houses are painted in pastel colours. The Cathedral of St Mary of the Purification, built in the 12th and 13th centuries, is an example of Apulian Romanesque design. Contained within are the remains of the town's two patron saints, Bassus of Lucera and Timothy. 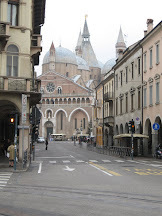 The walled city of Macerata in Marche is not among Italy's mainstream tourist destinations yet offers much to charm the visitor with its hill-town characteristics and maze of cobbled streets. 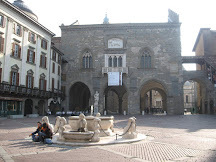 At the heart of the city, in the pretty Piazza della Libertà, is the Loggia dei Mercanti with its two-tier arcades, dating from the Renaissance. 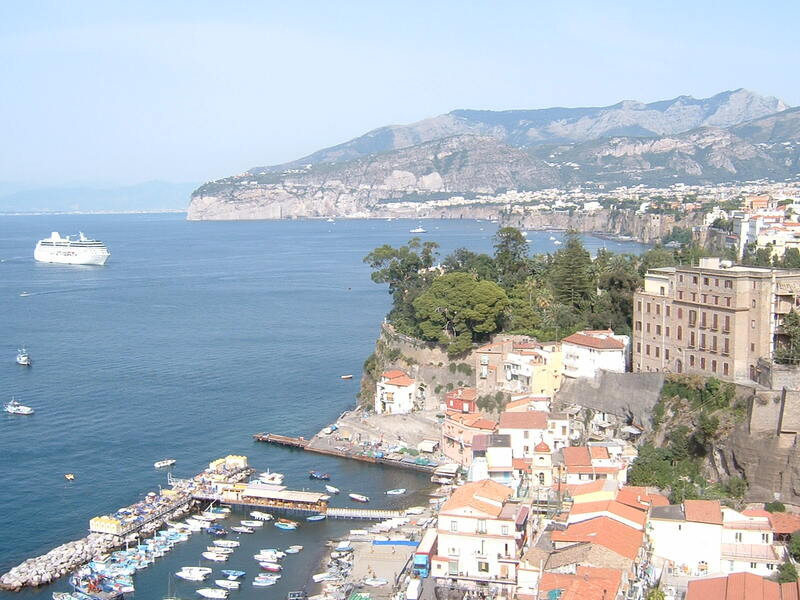 There are several beautiful palaces and a university that is among the oldest it Italy, established in 1290. 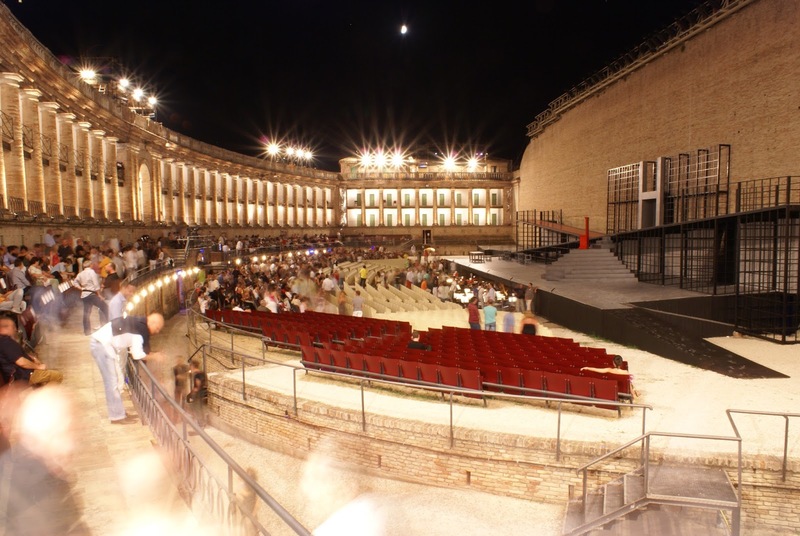 Each July and August the city hosts the Sferisterio Opera Festival, one of the most important dates on the Italian opera calendar, which is held in the 2,500 seat open-air Arena Sferisterio, a huge neoclassical arena built in the 1820s. Most of the world's great opera singers have performed there, attracted by its perfect acoustics, and it has been credited with staging some of the finest productions in the history of numerous regularly performed works, including Ken Russell's direction of Puccini's La Bohème in 1984.